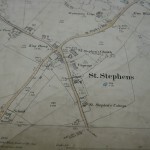 Posted 9 October 2013 & filed under 19th century, Churches, Early 20th century, St Stephen's churchyard and field, Streets. I can find nothing certain about the date of the house. It may be early Georgian. Tudor bricks (according to Mr C. Ashdown the antiquarian here) form the base of some of the cellar walls to indicate that there was a much older house on the site. The house is in two blocks – the larger of three stories (sic), the smaller of two. It consists of the following rooms etc. The Ground floor: – Large entrance hall – large dining room – large drawing room, small garden room and lavatory – kitchen – scullery – servants’ sitting room – larder – pantry – small store room. First floor: – Study – seven bed (or dressing) rooms – large box-room – pantry – bathroom, lavatory. Top floor – Five bedrooms. Outbuildings: – Small ‘home farm’ buildings viz: three brick cowsheds and pigsty. 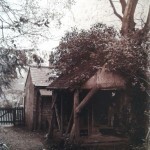 Gardener’s or chauffeur’s cottage of five rooms – stabling for 4 horses – two coach houses (or garages) large & small – 4 large coal & wood sheds – dairy (formerly). 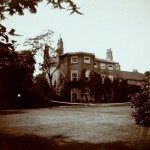 The house and grounds were not acquired as a Vicarage till 1841 when the then vicar, the Rev, M.R. Southwell bought them. 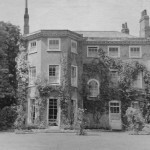 They were formerly the property of the Verulam family as a dower house. The Vicarage garden and grounds (of about 2¼ acres) are of great natural beauty. 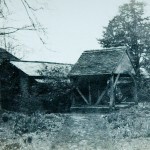 They include an orchard walled on two sides and adjoining the churchyard, a large lawn on the Eastside of the house and a small lawn on the West on Watling Street side, a large walled kitchen garden, a glade at the south side of the large lawn, two shrubberies with trees, a pleasant little wood with fine trees opening from the bottom of the large lawn. 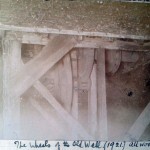 There is an ancient and picturesque well with the wheels and cogs of wood. It has not been used since the town water became available. “t. Taylor 1745” carved in the middle wheel is probably authentic. “C. A. Linney 1744” on the largest wheel is certainly not. The number of forest and other trees in the grounds is remarkable and so is the variety of them. 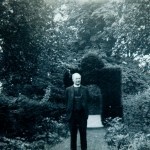 There are (June 1921) 82 trees in the gardens and 25 in the little wood (exclusive of shrubs). The trees are yew, lime, chestnut (red, white and sweet), beech, mulberry (on the large lawn incidentally very old), thorn (i.e. May, red and white), prunus, elm, scotch fir, holly, hazel, acacia, sycamore, maple, ash, sloe, crab-apple, almond, elder. (No oak -though there is one in the glebe). The shrubs also are of many kinds – lilac, laurel, syringe, box, berberis, olearia broom, flowering currant, pyrus (!) japonica, honeysuckle etc. At 1 foot from the ground 24feet – at 3 feet from the ground 26¼, at 6ft from the ground 31 feet. The greatest “spread” (i.e. across from side to side) of its branches is 84ft. Its height is 62. 89 feet (62ft 10ins approximately). The growth of its limbs is remarkable several of these being the size of trees themselves. I can find nothing certain as to its age, but it has, as it deserves to have a legend of its own, and it has owls (!). The legend is that King Henry VIII (c.f.. The King Harry Inn) courted or even proposed to Anne Boleyn under it! It is true that she spent some time at Sopwell close by. The Cedar is a great possession and a constant delight. 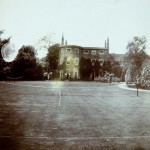 The garden and grounds are enclosed by park-like glebe land (also with fine trees) and by the Churchyard. 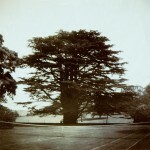 Among the trees of the latter, the magnificent horse chestnut (planted November 22nd 1785) is well known in St Albans. The tree growing on the lawn at the entrance to the glade in an apparently fallen position, according to the authorities at Kew, is a plum-leaved haw, somewhat rare, very old and now unfortunately slowly dying. 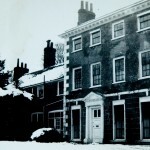 St Stephen’s vicarage was demolished in 1970s after it was vandalised by homeless youths in the time of the Rev. Anthony Hart-Synnot. 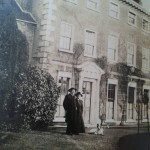 Here are some images of what the vicarage used to look like. 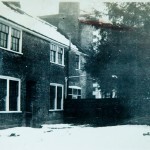 The vicarage was sited where Vicarage Close is today. In February 2015, the old well was rediscovered near the church car park. I am interested in the old orchard and the trees. Do you know who supplied them? I am researching Sprigings Nursery. I have no idea but maybe others do? Please does anyone know if anything more was established about the well when it was rediscovered in 2015? I am interested to see if there is any comparison to be made with the well in the Vintry garden – which I think was possibly only a Victorian ‘garden feature’. Thank you Sandy. I appreciate that.